Under the agreement, UNICEF, UNFPA or UN Women may be called upon to execute projects financed by CDB to reduce poverty and accelerate the achievement of SDGs in the Caribbean Region, where external support is needed. There is also expected to be an exchange of knowledge and information relating to the achievement of the SDGs. 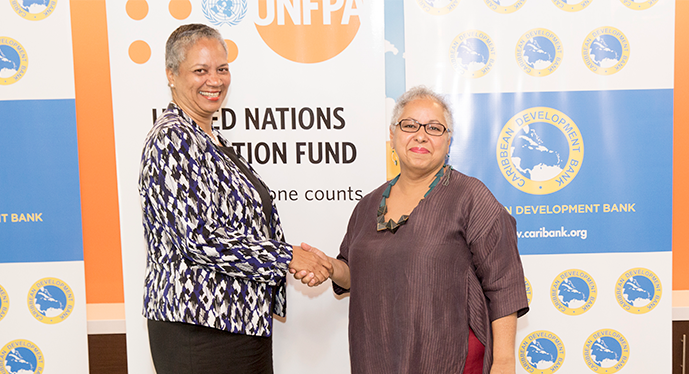 BRIDGETOWN, Barbados – The Caribbean Development Bank (CDB), UNICEF, UNFPA and UN Women have embarked on a collaborative approach, combining technical expertise and lessons learned over their many years of development work in the Region. In a time of shrinking resources, the agencies are partnering to support the achievement of Sustainable Development Goals (SDGs) in the Caribbean. CDB, UNICEF, UNFPA and UN Women today signed agreements that allow CDB to utilize expertise from the agencies in the execution of specific projects, which the Bank is funding so that the most effective outcomes for the Bank’s 19 Borrowing Member Countries are achieved. The signing took place at CDB’s headquarters. “The signing of these agreements underscores the value of partnerships in helping Caribbean countries achieve their goals and targets under the 2030 Agenda for Sustainable Development. We welcome this strengthened cooperation between CDB, UNICEF, UNFPA and UN Women and look forward to working together towards the ultimate goal of no poverty,” La Bennett said. “The UNICEF Eastern Caribbean Team has long been emphasizing the importance of the relationship and strong partnership with the CDB. We at headquarters equally recognize that importance. We will go from strength to strength to build an even more beautiful partnership for the children and young people of the Caribbean,” she added. “The signing of this agreement with the Caribbean Development Bank will open opportunities for wide collaboration efforts towards the systematic reduction of poverty in the Caribbean through social and economic development. UNFPA looks forward to sharing our technical expertise and evidence-based support to ensure that every woman, adolescent, and youth in the Caribbean can realize their full potential and contribute to economic and social transformation. UNFPA is committed to contributing to developing capacity in data collection and analysis to help governments track and analyze population trends in areas such as fertility, mortality, migration, and aging,” she said. Making the Sustainable Development Goals work for women and girls is central to achieving the SDGs. The attainment of Gender Equality is both a stand-alone goal – Goal 5 – and a goal that cuts across and has a direct and significant impact on the realization of the other 16 SDGs. “Working in development, we understand clearly that while we have individual agency mandates of focus, because each mandate has impact on the other, it is only through collaboration that we can be truly responsive to needs on the ground whilst working towards the realisation of safety and justice, resilience, equity, prosperity and the overarching goal of sustainable development for the Caribbean,” said Ms. M. Alison McLean, Representative - UN Women MCO Caribbean. “The United Nations agencies in the Caribbean are working under the common basis of the Multi-Country Sustainable Development Framework – the MSDF – to ensure coherence and appropriate scale in the design and delivery of programme support. In this time of shrinking resources, we are delighted to expand this cooperative approach to partner with the Caribbean Development Bank – a significant contributor to socio-economic development in the Caribbean, to meet the priority needs of the Governments and people of the Caribbean,” Ms. McLean continued.